Box Office 2.0: The Curious Case of "Orson Welles"
Amidst a busy Thanksgiving box office frame that saw such flashy specialty success stories as “Broken Embraces”‘s mammoth per-theater-average and “Precious”‘s continued success in semi-wide release, another indie success story was potentially being set in motion. The do-it-yourself release of Richard Linklater’s “Me and Orson Welles” got off to a very nice start, averaging $15,910 from its four theaters, the highest PTA of all debuting films. Though it has been seen time and time again that a potent debut does not necessarily translate into continued success through expansion, watching what happens to “Welles” over the next few weeks will be very interesting. While DIY releases from “Bottle Shock” to “Valentino: The Last Emperor” have recently managed strong final grosses, “Me and Orson Welles” is not your average do-it-yourselfer. Its director has an impressive resume that includes some American indie classics, and its star – Zac Efron – is one of the biggest teen idols on the planet. “Welles” follows Richard Samuels (Efron), a teenager who is cast in the Mercury Theatre production of “Julius Caesar” directed by a young Orson Welles (Cristian McKay) in 1937. Holly Gent Palmo and Vincent Palmo Jr. adapted the film’s screenplay from Robert Kaplow’s novel of the same name. After receiving funding from CinemaNX, a production company backed by the Isle of Man film fund, Richard Linklater came on board to direct. The film is being distributed through Freestyle Releasing (the company also responsible for “Bottle Shock”), in an arrangement orchestrated by financing and sales agency Cinetic Media. It had premiered without distribution at the 2008 Toronto International Film Festival over fourteen months ago. At the time, Toronto’s co-director Cameron Bailey predicted to indieWIRE that “Welles” was definitely going to be one of the fest’s big sells. This suggestion was echoed in the trades, with Anne Thompson, then working for Variety suggesting it would be one of the festival’s few seven figure sales. But when the festival was said and done, “Welles” hadn’t found a home, despite receiving a warm response from critics in Toronto. So Cinetic decided to take matters into their own hands. 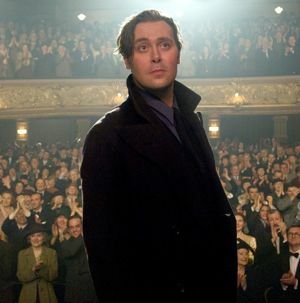 Christian McKay as Orson Welles. Photo courtesy of Freestyle Releasing. The film is being released in the UK this Friday (where CinemaNX and Vue Theaters in the UK have joined together to basically distribute the film themselves), and will continue to expand in the U.S. in the coming weeks. Sloss said that so far, things are looking positive, and Zac Efron doesnt even appear to be the main reason. While “Orson Welles” is one the first examples of such a high-profile film going to the DIY route, if it proves successful, it’s going to be done a lot more in the future.